Digital terrestrial television (DTTV or DTT) is a technological evolution of broadcast television and an advancement over analog television. DTTV broadcasts land-based (terrestrial) signals. The advantages of digital terrestrial television, are similar to digital versus analog in platforms such as cable, satellite, and all telecommunications; the efficient use of spectrum and provision of more capacity than analog, better quality images, and lower operating costs for broadcast and transmission (after the initial upgrade costs). A terrestrial implementation of digital television (DTV) technology uses an aerial to broadcast to a conventional television antenna (or aerial) instead of a satellite dish or cable television connection. Competing variants of broadcast television systems are being used around the world. Advanced Television Standards Committee created the ATSC standards that use an ATSC tuner in North America and South Korea—an evolution from the analog National Television System Committee (NTSC) standard. Integrated Services Digital Broadcasting (ISDB-T) is used in Japan, with a variation of it being used in most of South America. 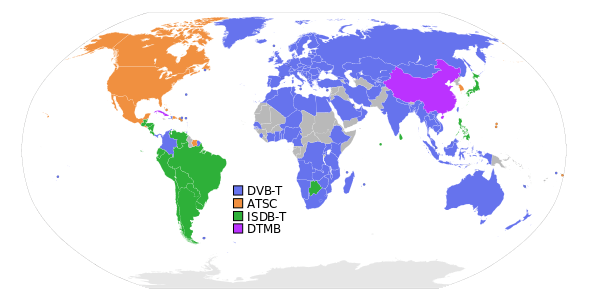 DVB-T is the most prevalent, covering Europe, Australia, New Zealand, Colombia and some countries of Africa. DMB-T/H is China's own standard (including Hong Kong and Cuba, though Hong Kong's cable operators use DVB); the rest of the world remains mostly undecided, many evaluating multiple standards. ISDB-T is very similar to DVB-T and can share front-end receiver and demodulator components. Several European countries have switched from analog to digital terrestrial television. DTTV is transmitted on radio frequencies through terrestrial space in the same way as standard analog television, with the primary difference being the use of multiplex transmitters to allow reception of multiple channels on a single frequency range (such as a UHF or VHF channel) known as subchannels. The amount of data that can be transmitted (and therefore the number of channels) is directly affected by channel capacity and the modulation method of the channel. The modulation method in DVB-T is COFDM with either 64 or 16-state Quadrature Amplitude Modulation (QAM). In general, a 64QAM channel is capable of transmitting a greater bit rate, but is more susceptible to interference. 16 and 64QAM constellations can be combined in a single multiplex, providing a controllable degradation for more important program streams. This is called hierarchical modulation. New developments in video compression have resulted in the H.264/MPEG-4 AVC standard which enable three high-definition television services to be coded into a 24 Mbit/s European terrestrial transmission channel. DTTV is received either via a digital set-top box (STB), TV gateway or integrated tuner included with television sets, that decodes the signal received via a standard television antenna. Some set-top-boxes and TV gateways include digital video recorder (DVR) functionality. However, due to frequency planning issues, an aerial capable of receiving a different channel group (usually a wideband) may be required if the DTTV multiplexes lie outside the reception capabilities of the originally installed aerial. This is quite common in the UK; see external links. Afghanistan started digital transmissions in MPEG-4 on Sunday, 31 August 2014. Afghanistan adopted DVB-T2 system for digital television. Israel started digital transmissions in MPEG-4 on Sunday, 2 August 2009 and analogue transmissions ended on 31 March 2011. Israel was the first nation in the Middle East and the first non-European nation to shut down its analogue TV distribution system. The new service which is operated by the Second Authority for Radio and Television in Israel currently offers 6 SD TV channels and 30 national and regional (private) radio services. According to government decisions, the system will expand to include two additional multiplexes that will carry new channels and HD versions of the existing channels. There is a proposition by the Ministry of Finance to run a tender in order to hand over the maintenance of the system to a private company that, in return, will receive an extended license and will be able to offer pay TV channels. In this matter nothing has been decided upon until the end on 2012. On 20 March 2013 it was announced that Thomson Broadcast had won a major contract with The Second Authority for Television and Radio for the extension of its nationwide DVB-T/DVB-T2 network. The Second Authority's order for new infrastructure includes two new multiplexes on thirty sites including three single frequency areas. This major deal incorporates a three-year service agreement for the global transmission system. The Japanese Ministry of Internal Affairs and Communications and DPA (The Association for Promotion of Digital Broadcasting-Japan) jointly set the specification and announced a guideline for "simplified DTT tuners" with price under 5,000 Japanese yen on 25 December 2007. MIAC officially solicited manufactures to put it on the market by end of March 2010 (end of fiscal year 2009). MIAC is estimating that 14 million, at maximum, traditional non-digital TV sets remain and need the "simplified DTT tuner" to be adapted even after complete transition to DTT after July 2011; it is aiming to avoid the disposal of large numbers of useless TV sets without such a tuner at one time. On 20 December 2007, the Japan Electronics and Information Technology Industries Association published rules for Digital Rights Management for DTT broadcasting under the name "Dubbing 10". Despite the name, consumers were allowed to use Blu-ray Disc and other recorders to "dub" or copy the video and audio of entire TV programs up to 9 times, with 1 final "move" permitted. Broadcasting with "Dubbing 10" was supposed to start at about 4:00 a.m. on 2 June 2008, but was postponed after lengthy talks with the Japanese Society for Rights of Authors, Composers and Publishers. It finally started about 4:00 a.m. on 4 July 2008. The manufacturers of DVD and DTT recorders were to make units conforming to the "Dubbing 10" rules, and some manufacturers announced plans for create firmware downloads to allow users to update their existing recorders. 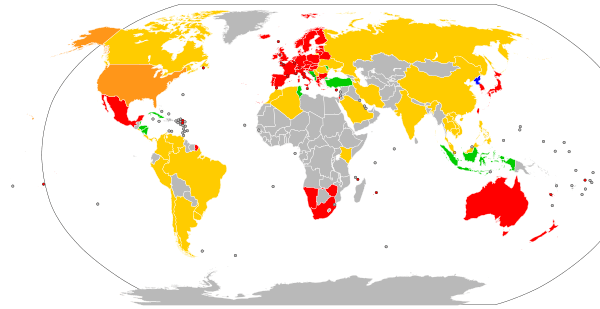 On 3 April 2008, DPA announced that a total of 32.71 million of DTT (ISDB-T) TV sets capable of DTT reception (excepting 1seg receivers) had been installed in Japan as of the end of March 2008. On 8 April 2008 DPA also announced guidelines for manufacturers of DTT receiving, record and replay unit which operate with personal computers. These add-on units operate on USB or PCI BUS, and went on sale on a reservation basis from late April, appearing in retail store in mid-May 2008. On 8 May 2008, the Ministry of Internal Affairs and Communications announced that 43.7% of homes had DTT (ISDB-T) capable TVs and/or tuners with DVD recorder by end of March 2008.It had been 27.8% one year before, and the ministry was expecting 100% penetration by April 2011. On 27 April 2009, National Association of Commercial Broadcasters in Japan (NAB) a new official mascot, Chidejika, to replace Tsuyoshi Kusanagi after he was arrested on suspicion of public indecency. On 3 September 2009, Ministry of Internal Affairs and Communications announced the procurement by tender of 5,000-8,000 sets of "simplified DTT tuners" with remote control for the city wide test transition from analogue to digital in Suzu, Ishikawa. The sets should be delivered by end November 2009. The program is aiming to examine the transition problem at individuals' home in country wide such as senior and non-technical families. Based on this rehearsal plan, analog TV transmission was interrupted in Suzu and parts of Noto for 48 hours, between noon on 2010/01/22 and noon on 2010/01/24. On 4 September 2009, ÆON announced the low cost "simplified DTT tuners" with remote control for ISDB-T to sell at JUSCO from 19 September 2009. The tuner is produced by Pixela Corporation, and met the retail price of under 5,000 Japanese yen, which is the target price to industry by Dpa (The Association for Promotion of Digital Broadcasting (デジタル放送推進協会, dejitaru housou suishin kyōkai)). The tuner connects to an old fashioned TV though an RCA connector with SDTV quality and some other minimal functions. On 7 September 2009, Ministry of Internal Affairs and Communications appointed two manufacturers I-O Data and Melco among 12 bids for minimal functioning "simplified DTT tuners" with remote control for ISDB-T of free supply to Japanese Temporary Assistance for Needy Families. Tuner connects to old fashion TV though RCA connector with SDTV quality and some other minimal function. On 24 July 2010 at noon, analog TV transmission officially stopped in Suzu and parts of Noto (approximately 8,800 homes) as the rehearsal plan that took place one year ahead of the nationwide shutdown, which is scheduled on 24 July 2011. Ministry of Internal Affairs and Communications shall watch what type of problem arise in transition to DTT which might apply to the nationwide shutdown. On 20 April 2011, Ministry of Internal Affairs and Communications confirmed, and made the resolution by the House of Councillors on 8 June 2011, that the analog terrestrial TV close down schedule on 24 July 2011 will be unchanged, with the exception being the close down having to be postponed by a maximum one year. Analog television shut down on 31 March 2012 in Iwate, Miyagi and Fukushima prefectures, which were heavily damaged in the 2011 Tōhoku earthquake and tsunami and the nuclear accidents that followed it. Analog television stations are required to cease normal programming at noon and shut down their signals at midnight. On June 11, 2010, National Telecommunications Commission of the Philippines announced that the country will use the Japanese ISDB-T International standard. The first fully operational digital TV channel is GEM-TV49 of the religious group Iglesia ni Cristo. However, in October 2012, GEM-TV49 has been replaced with INC TV (DZCE-TV) after its test broadcast in Analogue VHF format (ch. 49 (UHF)) therefore, Net 25 is also transmits in Digital format. (ch. 49 (UHF, ISDB-T International test broadcast)). On February 11, 2015, the major TV network ABS-CBN commercially launched the digital TV box called ABS-CBN TVplus also known as Mahiwagang Blackbox. 7 years before the commercial launch, the network initially applied for a license from NTC on digital free TV but the digital TV box was given away as a prize for the loyal viewers and listeners of ABS-CBN channel 2, DZMM (AM radio station of ABS-CBN) and DZMM TeleRadyo (TV-radio cable channel of ABS-CBN) after the initial application. Digital television transition is expected to be finished by 2020. Thailand and all other ASEAN nations have selected DVB-T as the final DTV standard, and are expected to switch off analogue broadcasts completely by 2015. In June 2008, participants of the 6th ASEAN Digital Broadcast Meeting from seven south-east Asian countries (including Thailand) agreed to finalise the specifications of the DTV set-top box for use within ASEAN, and also set up an ASEAN HD Centre to provide training on HDTV content to broadcasters in the region. The switch-off date has been postponed from 2015 to 2020. Digital TV was available in Malaysia in June 2015 by MYTV broadcasting. Malaysia government gives free MYTV set top box if your income is under RM3000 and below or under BR1M. You can watch 9 channels to choose from. They launch 13 Digital TV stations nationwide which covers up to 80% household. They planned to add more Digital TV stations and covers up to 99% household by end of 2017. By November 2016, MYTV set top box will be available for sale in electronics store nationwide. They planned to switch off analog TV by 2017-2018. France's TNT (Télévision Numérique Terrestre) offers 25 free national channels and 9 pay channels, plus up to 4 local free channels. An 89% DTT penetration rate is expected by December 2008. Free-to-view satellite services offering the same DTT offer were made available in June 2007. Since 12-12-2012 France has ten free HD channel (TF1 HD, France2 HD, M6 HD, Arte HD, HD1, L'Equipe 21, 6ter, Numéro 23, RMC Découverte HD, Chérie 25) and one pay TNT HD channel (Canal+ HD) on TNT using the MPEG4 AVC/H.264 compression format. French video website which rate 10/10 the Blu-ray image, rated 8/10 the TNT HD image. 8 February 2011: Digital broadcasting of regional scale channels BLUE SKY, CHANNEL 9, KONTRA Channel and ΤELEASTY added in Athens - Attica from the transmitting site of Aegina. A Houses of the Oireachtas Channel (reportedly shelved in December 2008) and the Irish Film Channel (whose status is unclear though a company has been formed to provide the channel)  are enabled for establishment as public service broadcasters on Irish DTT. As of October 30, 2010 FTA DTT, which will be known as Saorview, has launched  following a direction from the Minister for Communications, Energy & Natural Resources, to RTÉ and the signing of the RTÉ (National Television Multiplex) Order 2010 (S.I. No. 85 of 2010) on February 26, 2010. The rollout of FTA Saorview DTT will now proceed, and a commercial DTT competition may well be deferred until the economic situation improves. On 17 June 2015, Romania turned off analog broadcasting, and started broadcasting with DVB-T2 technology, but with very low coverage, and a very reduced number of broadcasts available. Because of low coverage, Romania will still broadcast TVR1 in analog format on VHF until 31 December 2015. DVB-T continues to be available for an undetermined period of time, only in Sibiu ( Ch 47 and Ch 54) and Bucharest ( Ch 54 and Ch 59). However, since the analogue turn-off, many people who were receiving TV on terrestrial shifted to a cable or DTH operator . To the present day, DVB-T and DVB-T2 are still in experimental broadcast. The delay of DVB-T launching is criticized by some people in Romania, as a form of sustaining the interest of cable and DTH providers, by delaying the stable launch of DVB-T and decreasing the number of channels ( once, there were available 18 channels in DVB-T, even 3 in HD) but to the present day the number has fallen to only 6, and continues to be lower, especially since TVR announced that they will reduce the number of channels (TVR news will be shut down, probably because of low audience, the same for TVR 3, and the fate of TVR HD, which is one of the channels with the highes audience in TVR Group after TVR1, is unknown). Kanal D left terrestrial platform on 2 July 2015, and, Antena 3 is the only channel except TVR's available on terrestrial in DVB-T. It is unknown whether Antena 3 will remain available on DVB-T, will shift to DVB-T2, or fully leave the terrestrial platform . Antena Group channels were once available both analogue and digital in terrestrial. Also, many people in Romania are somehow surprised by the fact that Romania had regressed in terrestrial broadcasts, because in analogue there were, once, about 8 channels ( in Bucharest), and decreasing to only 6 channels in Digital terrestrial is a regress. However, terrestrial TV was heavily surpassed both by DTH, or Cable, some people are even watching foreign FTA on satellite, because foreign broadcasts are having a more interesting content than Romanian channels. To the present day, DVB-T and T2 are still in tests. Although many TV sellers are marking DVB-T2 capable sets as being compatible with digital terrestrial television in Romania, by highlighting this feature with a sticker on the TV, buyers are mainly interested if the TV has digital cable tunner or digital satellite tuner, however TV sets without DVB-T2 continue to be sold with only DVB-T/C and sometimes S2, as cable and satellite compatibility presents most of interest. DTT was successfully launched in November 2009. It uses MPEG-2 for SD and MPEG-4 for HD. The service was launched by ONE, and the platform is called BoomTV. It offers 42 channels including all national networks and it is available to 95% of the population. In Mexico, digital signals are, as of 2010, currently on-air in the largest cities, with more cities to be added in descending order of population size, until full national coverage is reached on December 31, 2015. At that point analogue broadcasts will officially end. In the United States on 12 June 2009, all full power U.S. television broadcasts became exclusively digital, under the Digital Television and Public Safety Act of 2005. Furthermore, from 1 March 2007, new television sets that receive signals over-the-air, including pocket sized portable televisions, include ATSC digital tuners for digital broadcasts. Prior to 12 June 2009, most U.S. broadcasters were transmitting in both analogue and digital formats; a few were digital-only. Most U.S. stations were not permitted to shut down their analogue transmissions prior to 16 February 2009, unless doing so was required in order to complete work on a station's permanent digital facilities. In 2009, the FCC finished auctioning channels 52–59 (the lower half of the 700 MHz band) for other communications services, completing the reallocation of broadcast channels 52–69 that began in the late 1990s. The analogue switch-off rendered all non-digital television sets unable to receive most over-the-air television channels without an external setbox receiver; however, low-power television stations and cable TV systems were not required to convert to digital until 1 September 2015. Beginning 1 January 2008, consumers could request coupons to help cover most of the cost of these converters by calling a toll free number or via a website. Some television stations had also been licensed to operate "nightlights", analogue signals which consisted only of a brief repeated announcement advising remaining analogue viewers how to switch to digital reception. El Salvador chose the American ATSC standard on April 22, 2009. In Brazil, they chose a modified version of the Japanese ISDB-T standard, called ISDB-Tb (or SBTVD) in June 2006. Digital broadcast started on 2 December 2007 in São Paulo and now it is under expansion all over the country. As of 15 September 2009, metro areas of São Paulo, Rio de Janeiro, Belo Horizonte, Brasília, Goiânia, Curitiba, Porto Alegre, Salvador, Campinas, Vitória, Florianópolis, Uberlândia, São José do Rio Preto, Teresina, Santos, Campo Grande, Fortaleza, Recife, João Pessoa, Sorocaba, Manaus, Belém, Aracaju, Ribeirão Preto, Boa Vista, Macapá, Porto Velho, Rio Branco, São Carlos, São José do Rio Preto, São Luís, Pirassununga, São José dos Campos, Taubaté, Ituiutaba, Araraquara, Feira de Santana, Itapetininga, Sorocaba, Presidente Prudente, Bauru, Campos dos Goytacazes, Londrina, Juiz de Fora, Campina Grande, Caxias do Sul, Franca, Rio Claro and Cuiabá have digital terrestrial broadcasting. By 2013 the digital signal will be available in the whole country. Analogue shut-off is scheduled for 2023. Colombia has chosen the European DVB-T standard on 28 August 2008. It is expected that by year end 2009 some 42% of the Colombian population would be able to receive digital TV coverage. On the African continent the trend is still to use the European standard "DVB-T2", which is the most modern system of broadcasting. Countries that have adopted the standard are: Algeria, Angola, Botswana, Democratic Republic of the Congo, Ethiopia, Ghana, Kenya, Lesotho, Madagascar, Malawi, Mali, Mauritius, Mozambique, Namibia, Nigeria, Seychelles, South Africa, Swaziland, Tanzania, Togo, Uganda, Zambia and Zimbabwe. 1 2 3 Webfactory www.webfactory.ie. "Digital Video Broadcasting - Standards & Technology". DVB. Retrieved 2010-09-02. ↑ Blog series: Is Over-The-Air (OTA) HDTV right for you | Tablo. Tablotv.com. Retrieved on 2014-06-23. ↑ BBC www.bbc.co.uk/reception (2009-06-16). "Television Aerials Factsheet" (PDF). BBC. Retrieved 2010-09-28. ↑ Digea www.digea.gr (2009-06-16). "Aerials for Digital Television". Digea. Retrieved 2010-09-28. ↑ . Afghanistan formally launches digital broadcasting system. ↑ News. DVB. Retrieved on 2014-06-23. ↑ Archived September 5, 2011, at the Wayback Machine. ↑ Chapter 1 : Introduction. (PDF) . Retrieved on 2014-06-23. ↑ "地上デジタル放送用「簡易なチューナー」購入に係る公募" [Announcement for Simplified DTT tuners bidding] (PDF). Ministry of Internal Affairs and Communications. Archived from the original (PDF) on 2009-09-03. Retrieved 2009-09-11. ↑ 低価格のイオン向け地上デジタルチューナー発売のお知らせ [Announce of selling low cost tuner for Digital terrestrial television to ÆON] (in Japanese). Osaka, Japan: Pixela Corporation. Archived from the original on 2009-09-04. Retrieved 2009-09-08. ↑ "「簡易なチューナー」の購入に関わる公募の結果" [The result of open bidding for "simple tuner" procurement] (PDF) (in Japanese). Tokyo, Japan: Ministry of Internal Affairs and Communications and NTT-ME (NTTエムイー, enuthithi-emuī). Archived from the original (PDF) on 2009-09-07. Retrieved 2009-09-08. 1 2 "Japan Completed Analog Switch Off in Terrestrial Television Broadcasting Successfully". Tokyo: Ministry of Internal Affairs and Communications. July 2011. Retrieved 2011-08-02. ↑ Brasor, Philip, "Today is D-Day for analog television", Japan Times, 24 July 2011, p. 9. ↑ "NTC picks Japanese model for digital TV". Manila: Malaya. 2010-06-11. ↑ フィリピン共和国が地上デジタルテレビ放送日本方式を採用する規則に署名 [Philippines signed the regulation to adopt Japanese DTT broadcasting system] (in Japanese). Tokyo: Ministry of Internal Affairs and Communications. 2010-06-11. 1 2 Bayos, Kris (16 September 2014). "NTC expects shift to digital TV by 2020". Retrieved 20 January 2015. ↑ "ASEAN picks DVB-T as common TV standard". 2005-06-17. Archived from the original on 2007-07-14. Retrieved 2008-06-21. ↑ "Asean Broadcasters Prepare For Digital Broadcasting". Bernama (Ministry of Information). 2008-06-19. Archived from the original on 2009-02-20. Retrieved 2008-06-21. ↑ "Switchover from analogue to digital broadcasting". Europa.eu. Retrieved 2009-08-12. ↑ "eCommunications: National Switchover Plans | Europa — Information Society". Ec.europa.eu. Retrieved 2009-08-12. ↑ "DigiTAG". DigiTAG. Retrieved 2010-09-02. ↑ "Комисия За Регулиране На Съобщенията". Crc.bg. Retrieved 2009-08-12. ↑ Webfactory www.webfactory.ie. "Digital Video Broadcasting — Bulgaria". DVB. Retrieved 2009-08-12. ↑ Аналоговият ТВ сигнал спрян окончателно, 100 000 са без телевизия - Днес.dir.bg. Dnes.dir.bg. Retrieved on 2014-06-23. ↑ "Digita". digitv.fi. Retrieved 2009-08-12. ↑ "Digita Oy — We deliver your content". Digita.fi. Retrieved 2009-08-12. ↑ Webfactory www.webfactory.ie. "Digital Video Broadcasting — Finland". DVB. Retrieved 2009-08-12. ↑ lefigaro.fr. "Le Figaro — Flash actu: Le passage au tout numérique en 2011". Lefigaro.fr. Retrieved 2009-08-12. ↑ "CSA — Décisions — Consultation publique sur le lancement d'appels à candidatures pour des télévisions locales". Csa.fr. 2009-06-08. Retrieved 2009-08-12. ↑ "CSA — Communiqués de presse — Progression de la télévision numérique terrestre aux mois d'avril et mai 2009". Csa.fr. 2009-06-02. Retrieved 2009-08-12. ↑ Webfactory www.webfactory.ie. "Digital Video Broadcasting — France". DVB. Retrieved 2009-08-12. 1 2 "ATV's News Archive April 6th — April 10". Advanced-television.com. 2009-03-03. Retrieved 2009-08-12. 1 2 "AFP: Télévision: le calendrier d'extinction de l'analogique officialisé, avec l'outre-mer". Google.com. Retrieved 2009-08-12. ↑ Webfactory www.webfactory.ie. "Digital Video Broadcasting — Germany". DVB. Retrieved 2009-08-12. 1 2 3 "Greece to launch DTT in November". Broadband TV News. 2008-08-07. Retrieved 2009-08-12. ↑ "Back to Earth for terrestrial TV - The Irish Times - Fri, Dec 04, 2009". The Irish Times. 2009-12-04. Retrieved 2010-09-02. ↑ "BCI announces Community Television Special Scheme". Bci.ie. 2008-07-21. Retrieved 2009-08-12. ↑ "Boxer pulls out of DTT contract — RTÉ - 20 April 2009". Rte.ie. 2009-04-20. Retrieved 2009-08-12. ↑ McCaughren, Samantha (2010-05-02). "Digital television negotiations reach crisis point | The Post". Thepost.ie. Retrieved 2010-09-02. ↑ Independent.ie (2010-05-05). "Chorus-NTL renamed UPC as it rings changes with new services - Irish, Business". Independent.ie. Retrieved 2010-09-02. ↑ "Irish DTT on the brink after Easy TV refuses BAI offer". Broadband TV News. 2010-05-16. Retrieved 2010-09-02. ↑ "Bealach Scannán Na Héireann / Irish Film Channel Limited - Irish Company Info - Solocheck". Solocheck.ie. Retrieved 2010-09-02. 1 2 "Major changes heralded in broadcasting as new laws enacted". Department of Communications, Energy and Natural Resources. 2009-07-15. Archived from the original on January 28, 2016. 1 2 "Minister Ryan discusses the Broadcasting Act". Department of Communications, Energy and Natural Resources/Youtube.com. 2009-07-15. ↑ "Broadcasting Act 2009 (Number 18 of 2009) - Tithe an Oireachtais". Oireachtas.ie. Retrieved 2009-08-12. ↑ "Minister Ryan announces end of Digital Terrestrial Television trial". Digitaltelevision.ie. 2008-07-24. Retrieved 2009-08-12. ↑ New York (2009-07-09). "RTE admits digital TV launch delay - Media, Business". Independent.ie. Retrieved 2010-09-02. ↑ "New digital service starts on trial basis". RTÉ News. 2010-10-29. Retrieved 2010-10-29. ↑ "Parliamentary Debates (Official Report - Unrevised) Dáil Éireann Tuesday, 2 March 2010 - Page 1". Debates.oireachtas.ie. Retrieved 2010-09-02. ↑ "Ryan: Ireland will meet DTT deadlines". Broadband TV News. 2010-06-03. Retrieved 2010-09-02. ↑ "RTÉ Appoints Director of Digital Switchover (DSO)". RTÉ Press Office. 1 July 2010. Retrieved 1 July 2010. ↑ "Minister Rabbitte Launches National Free to Air Digital Terrestrial Television". Digitaltelevision.ie. 2011-05-26. Retrieved 2012-01-11. ↑ "MINISTER RABBITTE ANNOUNCES DATE FOR DIGITAL TV SWITCHOVER". DCENR. 2011-10-14. Retrieved 2012-01-12. ↑ Saorview. Saorview.ie (2012-08-22). Retrieved on 2014-06-23. ↑ "Luxe.tv to join Luxembourg DTT | Broadband TV News". Broadband TV News<!. 2007-10-30. Retrieved 2009-08-12. ↑ Webfactory www.webfactory.ie. "Digital Video Broadcasting — Luxembourg". DVB. Retrieved 2009-08-12. ↑ "Dutch cable fights back | Broadband TV News". Broadband TV News<!. 2008-11-30. Retrieved 2009-08-12. ↑ Webfactory www.webfactory.ie. "Digital Video Broadcasting — Netherlands". DVB. Retrieved 2009-08-12. ↑ "Low coverage start for Portuguese DTT- BroadbandTVNews-Branislav Pekic — Wednesday, 15 April 2009". Broadbandtvnews.com. 2009-04-15. Retrieved 2009-08-12. ↑ "Romania unveils digital strategy". Broadband TV News. 2009-07-21. Retrieved 2009-08-12. ↑ "Romania eyes DTT subsidies | Broadband TV News". Broadband TV News<!. 2009-03-26. Retrieved 2009-08-12. ↑ Webfactory www.webfactory.ie. "Digital Video Broadcasting — Romania". DVB. Retrieved 2009-08-12. ↑ "Romania awards DTT services licence". Broadband TV News. Retrieved 2009-08-12. 1 2 "Romania awards digital licences". Broadband TV News. Retrieved 2009-08-19. ↑ Pavelescu, Mihai. "DIGITAL TERRESTRIAL-GO AHEAD-COMMENT / The Government favors state-owned Radiocom in the analogue switchover process". Media Expres. Retrieved 9 July 2013. ↑ "Spain approves DTT pay-TV | Broadband TV News". Broadband TV News<!. 2009-06-18. Retrieved 2009-08-12. ↑ Webfactory www.webfactory.ie. "Digital Video Broadcasting — Sweden". DVB. Retrieved 2009-08-12. ↑ Technology. "Website". Website. Inview Technology. Retrieved 9 December 2013. ↑ Andrews, Amanda (2009-05-04). "Freeview rolls out high definition for World Cup". London: Telegraph. Retrieved 2009-08-12. ↑ Webfactory www.webfactory.ie. "Digital Video Broadcasting — United Kingdom". DVB. Retrieved 2009-08-12. 1 2 "DVB in Republic of Macedonia". DVB.org<!. 2009-11-15. ↑ "DOF - Diario Oficial de la Federación". ↑ Title III of the Deficit Reduction Act of 2005, Pub. L. No. 109-171, 120 Stat. 4 (8 February 2006), codified at 47 U.S.C. § 309(j)(14). ↑ Bray, Hiawatha (2007-02-26). "FCC rule requires all new TVs to be digital". Boston Globe. Retrieved 2007-04-24. ↑ "FCC: Wireless Services: Lower 700 MHz". Federal Communications Commission. October 28, 2004. Retrieved May 9, 2007. ↑ Bahamas national TV to get multi-million dollar digital upgrade – video. The Bahamas Investor. Retrieved on 2014-06-23. ↑ コスタリカ共和国における地上デジタルテレビ放送、方式採用の決定について [lit. Republic of Costa Rica decided adoption on Digital terrestrial television methodology] (PDF) (in Japanese). Ministry of Economy, Trade and Industry. 2010-05-26. Retrieved 2010-05-26. ↑ "Costa Rica held its first broadcast on DTT ISDB-Tb". Panorama Audiovisual. 2012-03-21. Retrieved 2012-03-22. ↑ "Gaceta Oficial Digital". Gacetaoficial.gob.pa. Retrieved 2009-08-12. ↑ Gray, Kevin (2009-08-28). "Argentina adopts Japanese digital TV standard". Reuters. ↑ "Argentina started ISDB-T". Tokyo: DiBEG. Retrieved 12 June 2010. ↑ "Bolivia adoptará la opción de Tv digital japonés-brasileña ·". La-razon.com. Archived from the original on June 8, 2011. Retrieved 2010-09-02. ↑ "Erbol Comunicaciones - Periódico Digital". Erbol.com.bo. Retrieved 2010-09-02. ↑ "Gobierno de Chile adopta norma de Televisión Digital para el País". Subtel.cl. 2009-09-14. Archived from the original on 2009-09-22. Retrieved 2010-09-02. ↑ "42% of Colombia to get DVB this year". Rapid TV News. 2009-02-26. Archived from the original on February 27, 2009. Retrieved 2009-08-12. 1 2 EFE (28 December 2010). "Caracol y RCN inician emisión digital terrestre". El Espectador (in Spanish). Retrieved 30 December 2010. ↑ "RESOLUCIÓN 389 DE 2010". Comisión Nacional de Televisión. 16 April 2010. Archived from the original on 7 July 2011. Retrieved 30 December 2010. ↑ "Ecuador is the sixth country to adopt the standard of ISDB-T". 2010-03-25. Retrieved 2010-04-30. ↑ "Hoy se presentó informe de la TDT y se firmó memorandos de cooperación". Superintendencia de Telecomunicaciones. Archived from the original on June 3, 2010. Retrieved 2010-03-26. ↑ "Paraguay adopts ISDB-T as the standard of the terrestrial digital TV". Tokyo: DiBEG. 2010-06-02. Retrieved 2010-06-08. ↑ "Paraguay adopta sistema japonés de televisión digital". 2010-06-01. Retrieved 2010-06-02. ↑ "Peru begins digital TV transition process today". Dataxis. 2010-03-31. Retrieved 2010-09-18. ↑ "Peru adopts ISDB-T". Tokyo: DiBEG. 2009-04-29. Retrieved 22 May 2010. ↑ "Peru adopts ISDB-T". Tokyo: DiBEG. Retrieved 12 June 2010. 1 2 "FAQ digitale telivisie (DTC)". Telecommunication Authority of Suriname. Retrieved 9 July 2015. ↑ "TAS streeft naar digitale tv Suriname per juni". StarNieuws. 18 March 2015. Retrieved 9 July 2015. ↑ "'Digitale tv in juni 2015 niet haalbaar'". Suriname Herald. 19 March 2015. Retrieved 9 July 2015. ↑ Webfactory www.webfactory.ie. "Digital Video Broadcasting — Uruguay". DVB. Retrieved 2009-08-12. ↑ "DTT: Uruguay Regains Common Sense". Montevideo, Uruguay: ttv medianews. 2010-12-28. Retrieved 2010-12-29. ↑ "Uruguai adota padrão nipo-brasileiro de TV digital". Terra. 27 December 2010. ↑ ウルグアイ東方共和国における地上デジタルテレビ放送日本方式採用の決定・欧州方式採用の決定を覆し、技術的に優れた日本方式採用を決定 [Uruguay decided to adopt Japanese DTT system in afternoon 27 December 2010, disproved European system (DVB-T), and decided to ISDB-T which is superior technically.] (in Japanese). Ministry of Internal Affairs and Communications. 2010-12-28. Retrieved 2010-12-28. ↑ "Venezuela adopts ISDB digital TV standard". Digitaltvnews.net. Retrieved 2010-09-02. ↑ 地デジ、ベネズエラが日本方式採用へ5カ国目(Venezuela to Adopt Japanese Digital TV System, 5th country) Asahi Shimbun web site on 1 October 2009 (in Japanese) Archived October 4, 2009, at the Wayback Machine. ↑ "NBC Appoints Inview Technologies for Common Set-Up-Box System". talkmedianigeria.com. Talk media Nigeria. Retrieved 23 March 2015. ↑ "NATIONAL COMMON SET TOP BOX SYSTEM AGREEMNENT". nbc.gov.ng. National Broadcasting Commission of Nigeria. Archived from the original on 2 April 2015. Retrieved 23 March 2015. ↑ "The Strategy of the Republic of Albania for the Transition from Analogue to Digital Transmissions (Project). KKRT" (PDF) (in Albanian). 2008-12-05. Retrieved 2009-06-22. ↑ "Que es la TDT?". Archived from the original on 2010-02-14. Retrieved 2010-09-01. ↑ "Oz DTV switchover in 2013". Advanced Television.com. 2008-04-07. ↑ "Australia to launch Freeview service". Digital Television Group.org. 2008-07-18. ↑ "Legislation and research to advance digital TV switchover". Department of Broadband, Communications and the Digital Economy.gov.au. 2008-09-24. ↑ "Freeview Digital TV Platform Launch". australia.to. 2008. Archived from the original on March 13, 2009. ↑ "Package to drive digital television transition". Department of Broadband, Communications and the Digital Economy.gov.au. 2009-01-29. ↑ "Digital TV Switchover Australia". Department of Broadband, Communications and the Digital Economy.gov.au. 2009-03-30. ↑ "Digital TV Timetable by Region". Australian Government - Digital Switchover Taskforce. Retrieved 2013-04-09. ↑ "Digital switchover information for consumers". Archived from the original on 19 July 2008. ↑ "DVB-T: Zeitplan". DVB-T.at. Retrieved 2007-07-03. ↑ "Analogue terrestrial TV switch-off in the EU - briefing — EUbusiness - European Union business news search and analysis". Eubusiness.com. Retrieved 2010-09-02. ↑ "ORF stoppt im Juni digitalen Teletext". 2011-05-23. Retrieved 2012-10-13. ↑ "Weg met sneeuw op je tv! (Away with snow on your TV!)". ↑ "Bulgarian DTT woes continue". Broadband TV News. 2012-07-12. Retrieved 2012-09-05. ↑ "THE NEWS — Hannu Pro (video, audio, multimedia)". Hannu Pro. 2009-04-13. Retrieved 2009-08-12. ↑ "Broadcasting Public Notice CRTC 2007-53 - Determinations regarding certain aspects of the regulatory framework for over-the-air television". Canadian Radio and Television Commission. 17 May 2007. Archived from the original on 2008-04-05. ↑ "Bulletin of national standards". Web.archive.org. Archived from the original on 2007-06-23. Retrieved 2010-09-02. ↑ "Acuerdo de la CNTV en la cual se adopta el formato DVB-T para la TDT" (PDF). ↑ "HAKOM Hrvatska agencija za poĹˇtu i elektroniÄŤke komuinikacije — PoÄŤetna". Telekom.hr. Archived from the original on 2008-08-22. Retrieved 2009-08-12. ↑ "Czech Republic". DVB.org. 2009-07-22. 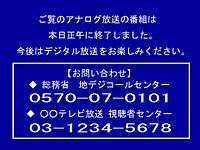 ↑ "Digi TV". Digi-tv.dk. Retrieved 2009-08-12. ↑ Webfactory www.webfactory.ie. "Barry Tew Boxer launches in Denmark — DVB.ORG - 7 April 2009". Dvb.Org. Retrieved 2009-08-12. ↑ "Julian Clover Danish launch saves Boxer's bacon- BroadbandTVNews- - Wednesday 16 April 2009". BroadbandTVNews. 2009-04-16. Retrieved 2009-08-12. ↑ "Launch of DTT services in Estonia". DigiTAG Web Letter. 15 December 2006. ↑ "Estonia — ASO to take place in 2010". DigiTAG attributed to the Estonian Government Committee for Transition to Digital Television. 2008-04-07. Retrieved 2009-02-15. ↑ "Ringhäälinguseadus §45¹ (15)" (in Estonian). Elektrooniline Riigi Teataja. Retrieved 2009-02-15. ↑ "Faroe Islands". DVB.org. 2004-01-21. ↑ "Finland will switch over to all-digital television". Finnish Ministry of Transport and Communications. 2007-08-31. ↑ "Digi-tv esillä ympäri maata". Finnish Ministry of Communications. Retrieved 2007-08-15. ↑ "France creates fund for ASO". BroadbandTVNews.com. 2009-07-23. ↑ "Accueil TNT". Tnt-gratuite.fr. Retrieved 2009-08-12. ↑ "CSA — Communiqués de presse — L'offre de la TNT s'enrichit de 8 nouvelles chaînes et verra prochainement son déploiement étendu à de nouvelles régions françaises". Csa.fr. 2005-07-19. Retrieved 2009-08-12. ↑ "Archive 2005". Advanced-television.com. Retrieved 2009-08-12. ↑ "Orange". Wanadoo.fr. Retrieved 2009-08-12. ↑ "Transition to the Digital Era". Minpress.gr. Retrieved 2009-08-12. ↑ (Chinese) 望月 (2007-06-09). "獨家專訪TVB 折解數碼廣播七大疑團 (Exclusive interview with TVB on digital broadcasting)". e-zone AVzone. pp. 4–5. ↑ "Working target for analogue switch-off changed to 2020". info.gov.hk. Retrieved 2014-12-09. ↑ "Hungary starts residential phase of digital switchover". Retrieved 2013-03-13. ↑ "Hungary set for digital switchover". Retrieved 2013-03-20. ↑ Konsorsium TV Digital Indonesia Archived September 21, 2009, at the Wayback Machine. ↑ "Peluncuran TV Digital: Digital Dividend pada Pita 700 MHz untuk WiMAX". Indonesian Infocom Society - Masyarakat Telematika Indonesia (MASTEL). ↑ "What is Digital Television?". "Department of Communications, Energy & Natural Resources". 2008-03-04. ↑ "BCI DTT Licensing Policy 2008 (Revised Edition" (PDF). "Broadcasting Commission of Ireland (Broadcasting Authority of Ireland)". 2008-02-09. Retrieved 2009-06-22. ↑ "BCI Issues Decision on DTT Multiplex Contracts". "Broadcasting Commission of Ireland" (Broadcasting Authority of Ireland)). 2008-07-21. ↑ "BCI DTT Licensing (DTT Multiplex Contracts: Applications received". "Broadcasting Commission of Ireland (Broadcasting Authority of Ireland (in 2009"). 2008-05-15. ↑ "Minimum Receiver Requirements for DTT in Ireland V1.0)(" (PDF). "Department of Communications, Energy & Natural Resources,Ireland". 2008-02-06. Retrieved 2009-06-22. ↑ "Coordination issue likely to delay DTT roll-out". The (Sunday Business) Post.ie-Thomas Crosbie Holdings Limited Archives. 2008-07-27. Archived from the original on 2009-02-26. ↑ "DTT Rollout". "Department of Communications, Energy & Natural Resources". 2008-03-13. ↑ "Minister Ryan announces end of Digital Terrestrial Television trial". "Department of Communications, Energy & Natural Resources,Ireland". 2008-07-24. ↑ "Broadcasting Bill Number 29 of 2008". Tithe an Oireachtais". 2009-04-03. ↑ < "Boxer pulls out of DTT contract". RTÉ. 2009-04-20. ↑ "BCI Awards DTT Contracts to One Vision". BCI. 2009-05-11. ↑ "Authority frustrated by delays in deal for digital TV". "Irish Independent". 2010-03-15. ↑ "RTÉ Saorview". RTÉ.ie. Retrieved 2010-10-29. ↑ "Parliamentary Debates (Official Report -(unrevised) Déil Éireann Tuesday, 2 March 2010 - Tithe an Oireachtais". Oireachtas.ie. Archived from the original on April 8, 2010. Retrieved 2010-03-15. ↑ "Going Digital.ie". "goingdigital.ieQ. Retrieved 2012-01-11. ↑ "Digital UK Northern Ireland". "digitaluk.co.uk". Retrieved 2012-01-11. ↑ "מאפייני הממיר/המקלט הדיגיטאלי לטלוויזיה" (PDF). Retrieved 2010-09-01. ↑ "Digital Television in Israel". Godigital.co.il. 2009. ↑ "Israel DTT goes nationwide". BroadbandTVNews. 2009-08-05. ↑ "Israel DTT goes nationwide". Broadband TV News. 2009-08-05. Retrieved 2009-08-12. ↑ "Digital Broadcasting Experts Group (DiBEG) promote ISDB-T". DiBEG. Retrieved 2009-08-12. ↑ On 20 April 2011, Ministry of Internal Affairs and Communications confirmed, and made the resolution by the House of Councillors on 8 June 2011, that the analog terrestrial TV closedown schedule on 24 July 2011 would remain unchanged, with the only exception being that the shutdown will be postponed for maximum one year in Iwate, Miyagi and Fukushima prefectures. These prefectures were heavily damaged by the 2011 Tōhoku earthquake and tsunami and the nuclear accidents that followed it. ↑ Webfactory www.webfactory.ie. "Digital Video Broadcasting — Lithuania". DVB. Retrieved 2009-08-12. ↑ "Broadcasting Center Europe: DVB-T / TNT". ↑ "DVB.org"%7cdate=2009-05-12 "About - DVB". ↑ "DVB.org"%7cdate=2009-06-16 "About - DVB". ↑ "NEC completes Morocco deal". "tradearabia.com". 2007-04-28. ↑ "Google Translate". "Translate.google.com". Retrieved 2009-08-12. ↑ Digital TV broadcasting to begin in Myanmar this week. NexTV Asia. Retrieved on 2014-06-23. ↑ "DVB.org"%7cdate=2009-05-08 "About - DVB". ↑ "Going Digital- When is my area going digital?". ↑ "TVNZ To Go HDTV For Beijing Olympics". ↑ "Process for analogue switch-off to digital TV". ↑ "RiksTV — Når kommer det?". RiksTV.no. Retrieved 2007-07-04. ↑ "Google Translate". Translate.google.com. Retrieved 2009-08-12. ↑ "DigiTAG". DigiTAG. Retrieved 2009-08-12. ↑ "La implementación de la TDT en el Perú" (PDF). telecentros.pe. 2008. ↑ "Chris Dziadu Technology breakthrough for Polish DTT- BroadbandTVNews- - 31 March 2009". BroadbandTVNews. 2009-03-31. Retrieved 2009-08-12. ↑ "Chris Dziadu Polish DTT nears- BroadbandTVNews- - Wednesday 15 April 2009". BroadbandTVNews. 2009-04-15. Retrieved 2009-08-12. ↑ Webfactory www.webfactory.ie. "Poland- DVB.org — Wednesday 20 July 2009". DVB.org. Retrieved 2009-08-12. ↑ "Qatar Goes DVB-T2". Digital Video Broadcasting Project (DVB). 11 Dec 2013. ↑ "Romania unveils digital strategy". BroadbandTVNews.com. 2009-07-21. ↑ "Romania opens DTT services tender". BroadbandTVNews.com. 2009-07-21. ↑ "Romania awards DTT services licence". BroadbandTVNews.com. 2009-08-12. ↑ "Romania approves late transition to digital terrestrial". 2013-06-24. ↑ "Romania Switching to DVB-T2". 2013-10-22. ↑ "Russian Federation". DVB.org. 2009-07-06. ↑ "Russia sets out DTT channel strategy". Broadband TV News. 2009-06-24. Retrieved 2009-08-12. 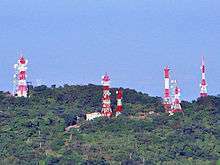 ↑ "Towercom outlines DTT plans". Broadband TV News. 2009-08-18. Retrieved 2010-09-02. ↑ "Éra analógového vysielania sa definitívne končí". 2012-12-28. Retrieved 2012-12-28. ↑ "South Africa". DVB.org. 2009-05-25. ↑ "South Korea". DVB.org. 2009-05-18. ↑ "KBS WORLD". KBS World. 2010-09-01. Retrieved 2010-09-01. ↑ "ATV's News Archive February 25th — February 29". Advanced-television.com. Retrieved 2009-08-12. ↑ Webfactory www.webfactory.ie. "Digital Video Broadcasting — Spain". DVB. Retrieved 2009-08-12. ↑ "Sri Lanka to digitalize TV broadcasting". DailyFT. Retrieved 2014-09-08. ↑ "Comment of the Minister for Internal Affairs and Communications on Adoption of Japanese Terrestrial Digital TV Broadcasting System (ISDB-T) in the Democratic Socialist Republic of Sri Lanka". Ministry of Internal Affairs and Communications. Retrieved 2014-09-08. ↑ "Nya tillstånd för digitala TV-sändningar". Swedish Radio and TV Authority. 20 January 2001. ↑ As of June 2007, H.264 is only used for HDTV in the Mälaren Valley region. ↑ "SF Info set for January DTT launch". Broadband TV News. 2008-12-16. Retrieved 2009-08-12. 1 2 3 Webfactory www.webfactory.ie. "Digital Video Broadcasting — Taiwan". DVB. Retrieved 2009-08-12. ↑ "CeBIT Broadcast, Cable & Satellite eurasia". Cebit-bcs.com. 2006-02-03. Retrieved 2009-08-12. ↑ "International Forum 'Digital Broadcasting in Ukraine". ITK (Television Industry Committee). ↑ "What is Digital Switchover?". DAS TV. 2007-07-01. Retrieved 2007-08-13. ↑ "Commerce Department Issues Final Rule To Launch Digital-to-Analog Converter Box Coupon Program". ↑ "TV Comverter box Programme website". National Telecommunications & Information Administration. 2007-03-12. Archived from the original on November 4, 2009.